Tortilla scoops or small appetizer bread, for serving. In a large bowl, whisk together olive oil, lime juice, honey, garlic, paprika, and cayenne and season with salt. Add shrimp and toss until fully coated, then cover and let marinate in fridge at least 30 minutes and up to 2 hours. In a large skillet over medium heat, cook shrimp until pink and completely opaque, 2 minutes per side. In a medium bowl, mash avocados with lime juice, Kelchner's Horseradish, red onion, jalapeño, and cilantro and season generously with salt. 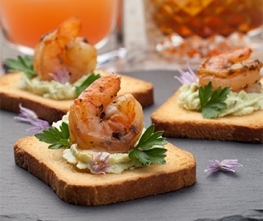 Dollop a tablespoon of guac into tortilla scoops or small appetizer bread, top with shrimp, and garnish with cilantro before serving.